Tengwar - asternbergs jimdo page! 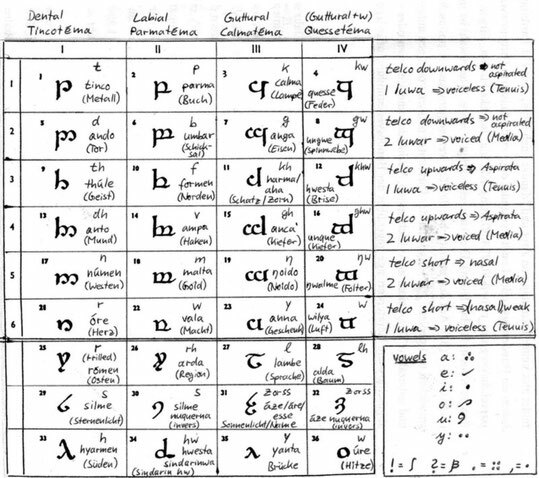 Tengwar is a system of letters that logically follows phonological rules. The shape of the letters characterises the phonological properties of the phonemes represented. 4th (Quessetéma): labiovelar (a guttural sound followed by a weak w-sound). Each téma has 6 grades (tyeller), which differ from each other in respect of voice, aspiration and nasality. The primary letters are each formed of telco (stem) and lúwa (bow). 4th téma: closed bow to the left. short telco > nasal (grades 5 and 6, since voiceless nasals are very rare the 6th grade is used for the weakest or ‘semi-vocalic’ consonants of each series). Each letter has a name which contains the sound represented by the letter in question. Usually, the Quenya ‘full names’ are used, even if the letter in Sindarin denotes a sound that does not appear in the Quenya name (this accounts for the discrepancies in the chart, representing the Sindarin writing system). The vowels in Tengwar are represented by so called tehtar (diacritics) placed above a consonantal letter. In Quenya (most words end in a vowel) the tehtar are placed upon the preceding consonant, whereas in classical Sindarin (most words end in a consonant) they are placed above the following consonant. If it is not possible to place the tehta above a consonant, it is placed above a ‘short carrier’ (like i without dot). Long vowels are represented by doubling of the tehtar (ô, û) or by placing them upon a ‘long carrier’ (like j without dot). The Sindarin mode of Beleriand uses letters for representing the vowels instead of tehta.